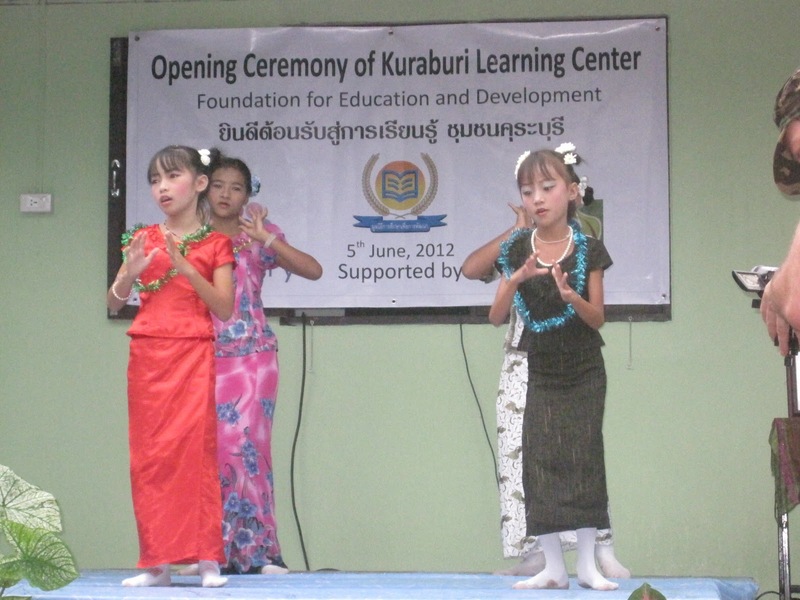 With our partners FED (Foundation for Education and Development), located just outside Kao Lak, we have been busy fundraising for a new school, built for the Burmese children, who used to be located at the Kuraburi pier district. We’ve been busy building six rooms for the students and teachers and also a playground area for the children; something they have not had before. Construction took around one and a half months and we are pleased to report the project is now completed; just some landscaping and painting to be finished. We had a wonderful opening ceremony attended by FED directors, staff and all the children. 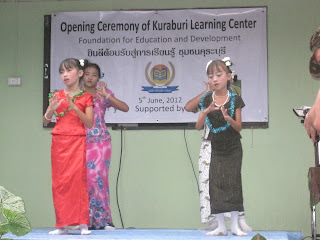 Some children performed a beautiful dance for us to mark the opening of this new learning center and after the official opening ceremony we all sat down to a delicious lunch, served outside, in true Burmese and Thai style. The day after the ceremony the new school opened its doors for the children to start their new semester in proper classrooms and comfortable conditions. On Wednesday we had the great pleasure to welcome staff from Mulberry, one of our main donors, Daniela and Evelyn to see the new school and meet some of the children. The new school has been renamed “The Mulberry Learning center”. Supporters and donors from all over the world have been so kind to get this project off the ground. First we took Daniela and Evelyn to see the old school; they were pretty shocked to see the basic conditions of the old school and how easily it flooded during the rainy season. They also saw the old furniture that was used and wondered how the children managed to sit at these desks and write, most had holes in them and the wood was rotten.They appreciated the visit to the old school and to see the contrast of the new school and realize how great it is for the children today with their new rooms and equipment. They were very pleased to see the new school and were enthusiastically welcomed by the children. They gave the children paper and pens and asked them to draw the school of their dreams. In fact, it was amazing to see that the children were drawing the same kind of dream school that they have nowadays, wonderful. Daniela and Evelyn also met the first volunteers of the new school from Quebec , Camille, Charlotte and Anne-Frederic and enjoyed listening to their experience of how great it is to teach English there. We really appreciate all the generosity and goodwill of our donors and supporters and volunteers; a very big thank you to you all. Feel free to contact us if you would like further information on this project. Yes i agree with your post. It contains very important data and i use it as my personal use. Your 95% posts are useful for me and thank you so much for sharing this wonderful blog. The accepted form of academic writing in the social sciences can vary considerable depending on the methodological framework and the intended audience. comparison essay outline is all about academic writing. Biology, the study of life, can be fascinating and wondrous. However, certain biology topics can sometimes seem incomprehensible. The best way to get a clear understanding of difficult biology concepts is to study them at home, as well as at school. Students should use quality http://dohomeworkfor.me/ resources when studying. Below are some good resources and information to help you answer some of your biology homework questions.